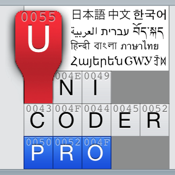 “Unicoder Pro” is a multi-purpose universal character operating tool that offers complete Unicode chart, universal keyboard, powerful character search, and full-featured information display with a consistent interface. *Reduced free version “Unicoder Lite” is also available. Please try it if you only need a mere Unicode chart and a universal keyboard. A kind of scrollable code chart and huge touch keyboard with as many as 252,448 keytops. You can enter a wide variety of characters covering about 400 languages world-wide and a large repertoire of symbols for diverse special fields. Utilizing excellent “Hanazono Font,” Unicode panel and Character Info Screen show glyphs of whole Eastern ideographic characters (Hanzi/​Kanji) as many as 75,616 included in Unicode 6.0. You can jump to the target character in the panel or extract matched characters by entering various search criteria. Search criteria may be either a single character, a hexadecimal code point, or a part of block/​character name. Also with the Extraction Search, you can search by variants, codes or Unicode properties as well as radical/​total strokes or Japanese/​Chinese/​Korean readings of Eastern ideographic characters (Hanzi/​Kanji). Wildcards are available for some criteria. You may easily pull up well-summarized information of the selected character including basic properties and several codes. Additional information will be given for Eastern ideographic characters such as radical strokes and readings, as well as useful English definitions. Also available is the Detailed Info Screen with more information, various codes/​encodings, and complete list of Unicode properties. You can select one of general codes or various encodings as a filter. The Code Filter grays out external characters that is out of the selected code set and inhibits them from entered. Choosing “Analyze” from the contextual menu executes Text Analysis which parses the selected text content into individual characters on the panel. Combining with Character Info Screen and Code Filter helps you to find out invisible irregularities and miscodings in the text with unknown problems.